As Cameron and I walk the fields checking out various plants, we are now looking for unwanted, tiny critters. I am sure many of you have experienced our greens with tiny holes in them. And checking out a small planting of tomatillos we found lots of little holes and tiny black bugs. Cameron was explaining what he learned in class about the flea beetle. They will eat little holes in leaves, but they also can spread viruses. Nigel was a big believer in letting nature take her course, but I think our balance is off. The problem you create when you use pesticides, even natural ones, is you often kill the beneficial bugs along with the pests. That makes sense, but what do we do about holes in our arugula and kale? I have been doing a little bit of reading on our options. Sticky yellow traps are one possibility. I know Nigel used them in the past. And even though the yellow will attract the good bugs, we would not be saturating a field killing everything out there. There is no spraying involved so that is plus. If we did spray we could use a mixture of kaolin clay and water. This is completely natural and non-toxic. 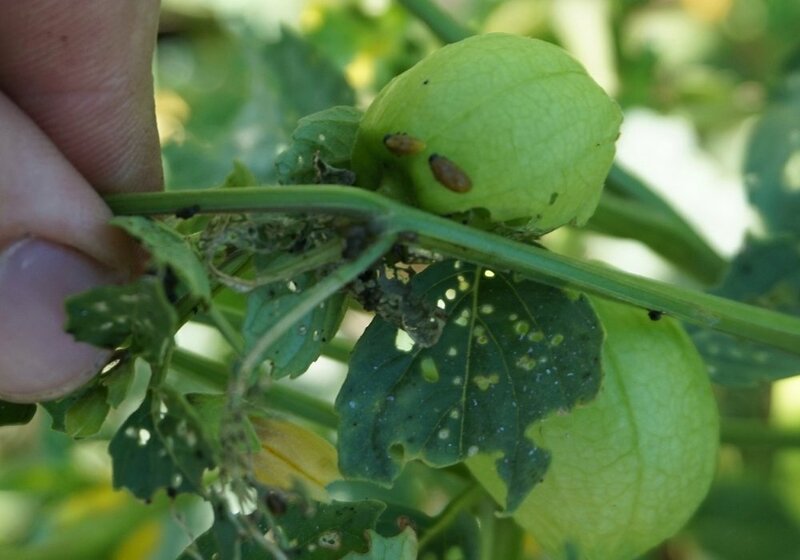 It makes the leaves very unappetizing, so bugs like flea beetles don’t eat them. Their predators would still have them to eat and we wouldn’t be killing those beneficial bugs. Perhaps this would be a positive way to bring things back into balance. One more option I would like to research further is the use of natural predators. We all love ladybugs and when they come in at the right time they do wonders on the aphids. Ladybug larva can eat up to 40 aphids in an hour! There are beneficial nematodes that kill the larvae of cucumber, scarab, Japanese, flea beetles, chafer, thrips, white grub, corn root worm, bilbug, CO potato beetle, black vine weevil, root mealybug. Pretty exciting stuff for a wanna be farm girl. Who would have ever thought?